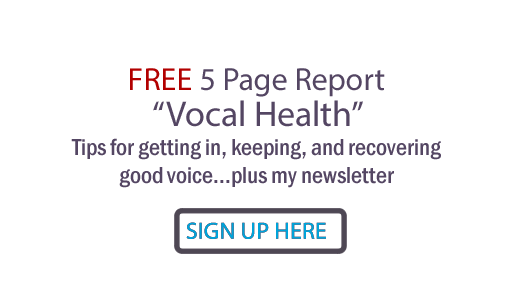 At a certain point in vocal training, my students reach new plateaus in vocal improvement by starting at their voice's end result first. I have them consciously focus on creating buzz! Buzz is not just a music promotion term, you see. It's a synonym for vibration, and for the voice it is all important where that vibration sets in. When vocal sound is created most effectively, the singer will feel a buzzing sensation in the chest, mask, I've heard some people say they even notice it in the tailbone!If we purpose to make a buzzy sensation in these places, we can (if we've developed the appropriate muscle memory before-hand), find our automatic nervous system directing our anatomy to line up and do just that... buzz our bones & sinuses! We must be careful not to confuse a buzzing mask or chest with throat voice. We must NOT be conscious of buzzing our larynx, unless we put our hand on the middle of our neck and feel it. We must also not confuse the mask buzzing with nasality caused by a closed or tight nose. The masky buzz desirable for great vocal tone has to have an open nose to vibrate. Buzz yourself, and you buzz your audience. They will love the feeling, too! If you taking vocal lessons don't forget to practice everyday practice will help you to get better.